Tuesday was hot and stuffy. I was at home, where you find the simple, ingenuous feeling of happiness. The happiness of being close to the native soil, of inner freedom and sweet contemplation. However, this happiness was only confined to my house-lane. Kashmir was churning protests and curfew was imposed once again. In utmost restrictions, I badly craved ice-cream. My free-will wanted to defy curfew. The decision was made. I slipped into the long, deserted street. Every shop was shuttered and every house in the vicinity didn't seem like a home. It was dead quiet. I saw a police van hovering and one person at his entrance, muttering in confusion. The whole scene didn't seem like a wicked fantasy, it was a reality, nevertheless. Kashmir seemed like a prison to me. I felt myself as a convict. I failed to shop and went back inside in gloom. At night, I saw houses lit up, in dead silence and light flickered. A buddy had told me that it was not safe to go outside. My friend was right. I realized that late and felt lucky. Maybe, a bullet would have traveled from that van and hit me or maybe a tear gas would have landed nearby. The situation in a part of our neighborhood was grave. Two neighbors had done a similar thing and one had a gun stung on his back and one was whipped to infliction. Its so easy to die here. You never know, when death can capture you. Many parts of Kashmir are boiling. Thousands have once again poured into streets to protest barbarity. Eleven have been dead and several have been critically wounded since the last three weeks. A nine-year old kid has been sent to an early grave. A fifteen-year old teen was messed up with a tear gas canister. There should be no physical suffering endured on a peaceful protest. Every thrust of a gas shell or a bullet can leave a person dead, easily. Human life is precious and essence of life must be protected and respected. They are unarmed protestors carrying no weapons. When these so-called security forces are eager to kill people in haste, people have no option but to reply back with lumps of stones and chunks of rocks. They force mourners to become mobs. If a similar protest happens in Jammu, they use water pumps to dislodge the crowd. Protesters there get a free shower and here people get fastball bullets. 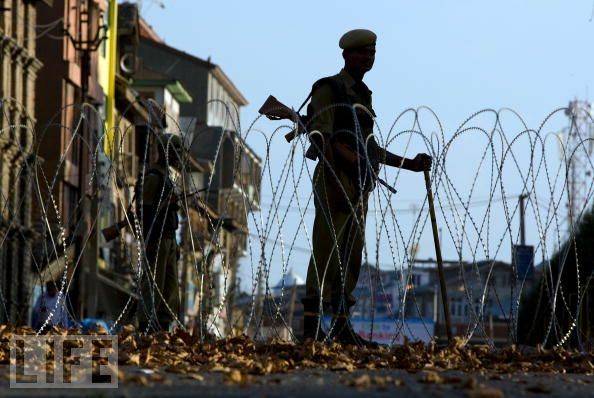 The attitude of Indian defense keepers and their policies vary extremely, when it comes to Kashmiris. Kashmiris protest for a reason and those who protest follow an ideology and an institution of thoughts. Rebellions are subjects, containing considerate and thoughtful acts, led by aware and educated men. People here want an end to endless suffering through violence, that's why people protest. They don't protest to romanticise violence. Kashmir would be a much better place if we have no sad men with green uniforms. That's the dilemma which the State of India can't solve, in-fact they're not even willing to admit their embarrassing mistakes. With every brutal killing, protests gather momentum to march and then Kashmir becomes an open prison; yet again it has been. It's a dilemma which only the the two countries can resolve.